Vancouver (pics) is the eighth largest city in Canada and the largest city in the province of British Columbia. It is said to be the most ethnically diverse city in Canada with 52% of its residents with a first language other than English. We stayed in Richmond, BC, a city just to the south of Vancouver. Two-thirds of Richmond’s residents are Asian, mostly Chinese. In order to discover Vancouver, we took the Skytrain, the Vancouver subway, to the waterfront area. 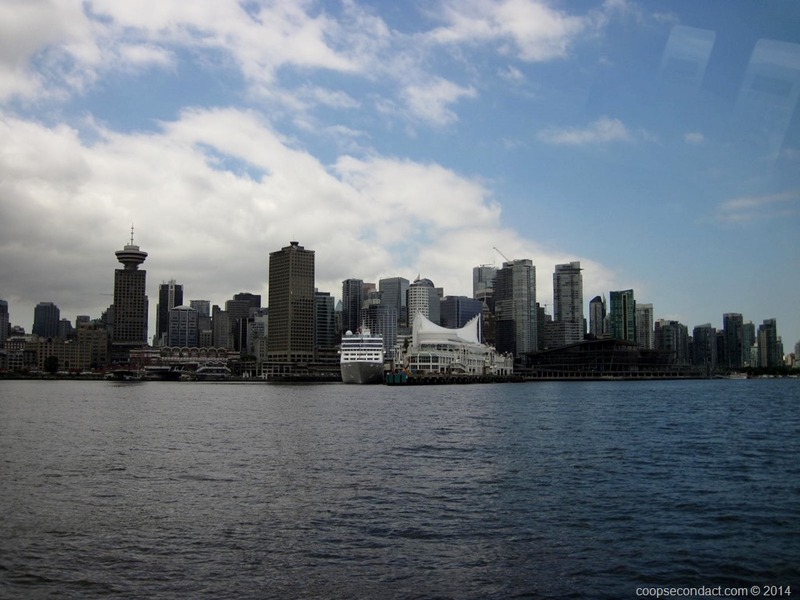 The most recognizable sight in Vancouver is Canada Place which is combination convention center and cruise ship terminal. With its five tall sails it looks like a massive sailing ship jutting out into the Berrard Inlet. From the next door Waterfront Station we took the SeaBus passenger boat which crosses the Berrard Inlet to North Vancouver. These boats cross the Inlet every 15 minutes and are a part of the Vancouver public transit system. 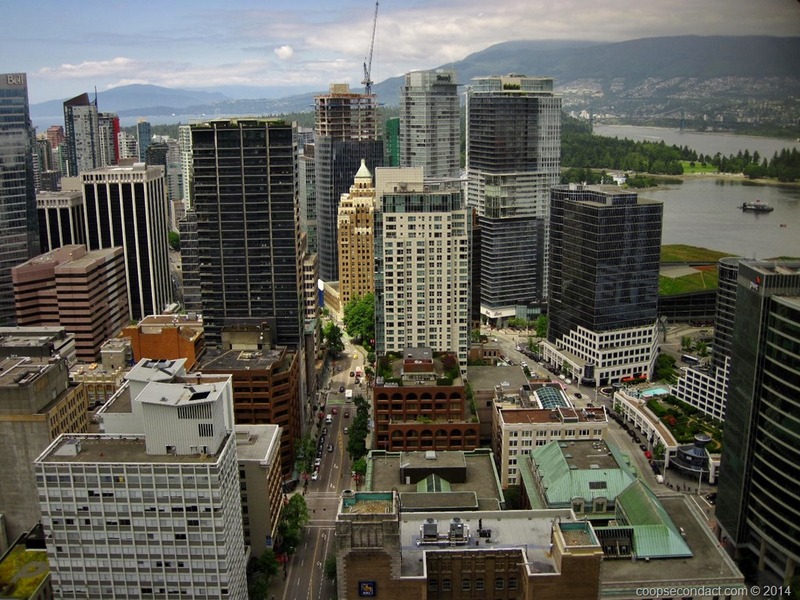 Back in downtown Vancouver, we took the elevator ride up in the Harbor Centre building to the Vancouver Lookout which at a height of 435 feet provides a terrific panoramic view of Vancouver city, harbor and mountains. Just a block away from Harbor Centre is the start of Gastown, the historic district of Vancouver. With its tree-lined cobblestone streets, Gastown is a delightful place to stroll and perhaps stop for a coffee at one of the sidewalk cafes. The most photographed spot in Gastown is the steam clock. That’s right, a clock that is operated by steam from a series of underground pipes that supply heat to many of the downtown office buildings. The steam also powers the clock’s whistles that play the Westminster Chimes every quarter hour. We finished our day at Granville Island which is located under the south end of the Granville Street bridge across False Creek from downtown Vancouver. 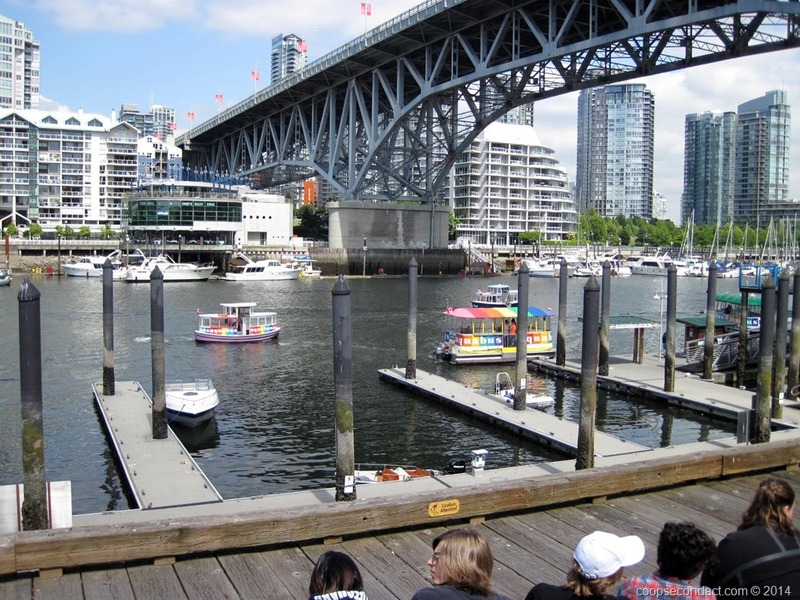 The island is home to many artisan shops and most notably, the Granville Island Public Market. Here you will find a large food market plus many ready to eat food shops and stalls. We enjoyed a nice snack here of vegetarian chili plus a wild rice and fresh spinach pie topped off by a piece of pecan caramel shortbread.